Shape.host Review 2019: Is Shape.host a Good Hosting? ShapeHost is a Romanian web hosting provider that was established in 2015. They currently have servers located in 15 countries worldwide, though their cloud VPS hosting solutions are primarily based in Europe and North America. ShapeHost is a Romanian web hosting provider that was established in 2015. Though relatively new to the market and staffed by a young team, ShapeHost has turned this to their advantage by building a flexible, user-focused business model offering cutting-edge technologies. They currently have servers located in 15 countries worldwide, though their cloud VPS hosting solutions are primarily based in Europe and North America. Once you select a base hosting package, your account will be live in seconds. You can then configure your hardware specifications in whatever way you’d like and install the operating system and software that best fit your needs. After you make payment, your server will be deployed in moments – yet another advantage of the cloud that regular VPS hosting services don’t offer. If you want to scale your resources up or down, you can do so via their intuitive account management portal. This is an aspect that ShapeHost has clearly invested a lot into; not only is it easy on the eyes, but it’s also user-friendly and robust in functionality allowing you to manage every aspect of your account. As with any VPS plan, you have full control over your server. You can re-install any operating system, reboot the virtual server, or even create multiple machines if you’d like. Their Windows VPS is especially easy to use even for those without a lot of technical knowledge, though ShapeHost provides free video tutorials to help you out as well. You can customize any aspect of your plan, such as the number of CPUs, RAM, and amount of storage. ShapeHost has servers located in 15 different locations including the United States, Canada, Spain, the United Kingdom, Singapore, and Australia. This ensures that no matter where your primary audience is located, your websites and applications will load speedily. If their cloud and VPS hosting packages are too much for your needs at this point, ShapeHost also offers bite-sized shared hosting packages that start with 500MB SSD storage and unlimited bandwidth per month. Compared to similar offerings of their competitors, ShapeHost offers far greater value for the same prices. Not only do they offer more resources and features, but their support is also equally impressive. They do have a seven-day money back guarantee, though this isn’t readily advertised on their website. 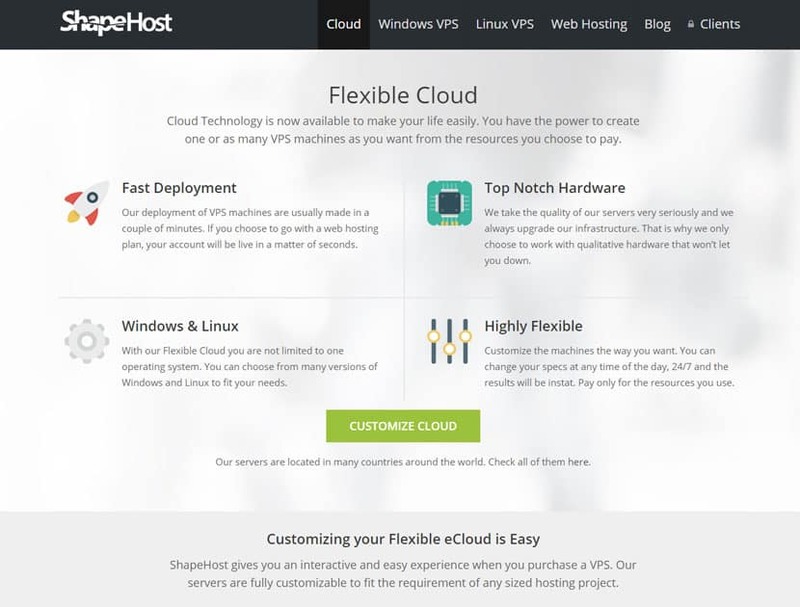 As expected of a VPS hosting provider, ShapeHost doesn’t have a free plan or trial available. They had a contest trading a year of free VPS hosting for social media shares some time ago, but it’s unclear whether they’ll do so again in the near future. However, they do offer special deals from time to time. An advantage of ShapeHost is that despite their higher-grade plans, they don’t tie you down with any contracts or setup fees. This comes in especially handy for businesses or projects that require a lot of flexibility: you have the option of upgrading, downgrading, or canceling your plan at any time via your account management portal. To make things even more flexible, you can even choose to make weekly payments if you’d like to test out certain configurations. ShapeHost is proud to be one of the few companies able to provide remote support via WebEx or TeamViewer. This means that not only can they give you verbal instructions on how to resolve an issue, but they can walk you through it step-by-step on your screen. ShapeHost also offers support via live chat, email, telephone, and has a sizable archive of YouTube video tutorials. Though they’re currently a little-known brand on the market, ShapeHost is definitely a rising star. With superior speeds, fantastic uptime, and highly dedicated support, ShapeHost is an excellent choice for those in the market for a VPS hosting provider. Wondering how Shape.host stacks up against other Web Hosting companies? Enter any other Web Hosting company and we will give you a side-by-side comparison.